PURPOSE: Staple-line reinforcement sleeves and Fibrin glue sealant during Laparoscopic Gastric Bypass (LGBP) have suggested to the risk of perioperative anastomotic leakage and bleeding. The aim of our study was to compare patients undergoing LGBP with and without these reinforcement material and compare the staple line vs. GJ anastomosis leak rate, bleeding, and rate of stenosis and ulcer of anastomotic site. We would hypothesize that the SLR would decrease the staple line leak, and that the FS would decrease the anastomotic leak rate and that neither should increase the stenosis and ulcer formation. 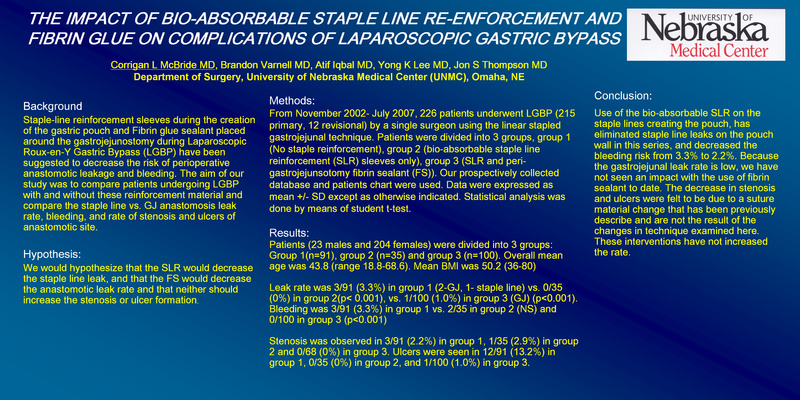 METHODS: From Nov 2002- July 2007, 226 patients underwent LGBP (215 primary, 12 revisional) by a single surgeon using the linear stapled gastrojejunal technique. Patients were divided into 3 groups, group 1 (No staple reinforcement), group 2 (bio-absorbable staple line reinforcement (SLR) sleeves only), group 3 (SLR and fibrin sealant (FS)). Our prospectively collected database and patients chart were used. Data were expressed as mean +/- SD except as otherwise indicated. Statistical analysis was done by means of student t-test.